The resurgent competition was set up some years ago by former cross country Captain Alan Rowell. It was as a means of encouraging the senior men to support the club in competing in the Harrier league with some friendly competition between DCH members. The competition name came from a news report at the time where Bill Mcguirk described the cross country team as the ‘resurgent Tangerines’. The competition was later extended to the senior women and the juniors and the ethos remains that it is friendly competition between club members with points rewarded for turning out for the club. It is not necessarily about being the best runner, but being the runner who turns out regularly to support the club at the Harrier League. More up to date reports can be found under the Bryan’s Northern Echo reports. The 2015 Durham Cathedral relays were again a huge success for the club. More teams entered this year with a remarkable Forty five teams from North Shields Poly. Dave Coxon took the helm of the organising this year and did a great job with his team making the event as successful as ever. Way back in its history this event ran around the river banks and through the market place, it would be impossible to do that now with the amout of runners. In the Senior and Veteran Womens race Emma Toogood took first leg for the seniors and Emma Bain for the veterans. Both had excellent runs returning in 5th(11:39) and 11th 12:10). Amy Etherington followed on 2nd leg for the seniors pulling them up to 4th (12:14) whilst Emma Thompson took 2nd leg for the veterans to 18th (13:35). Kat O’Mahoney was the final leg for the seniors finishing 8th (13:28) whilst Julia Quinonez closed for the veterans finishing 24th (14:20). Gemma Soulsby was our only incomplete team runner covering the 1st leg of the senior ‘B’ team in 14:47. Somehow we managed to lose Elise who was on the 2nd leg. In the senior races we had 3 teams with a mix of seniors and vets. The A Team led by Dan Jenkin (9:26) finished 6th overall with Peter Bray (10:18) on 2nd leg and Alex Mirley (9:57) on 3rd leg. The B team finished 25th led by Andy Graham (10:02), with Adam Walker (11:08) and Dave Henson (11:43). The C team finished 49th led by Paul Delaney (12:07) with David Hemming (12:27) and Geoff Watson (13:07). Thanks to everyone who came and ran and supported then club event. Durham City showed their strength at the town Moor in the Counties championship on the 13th of December with good team performaces in the senior events. It was disappointing to see so few junior team results having had full teams entered beforehand. 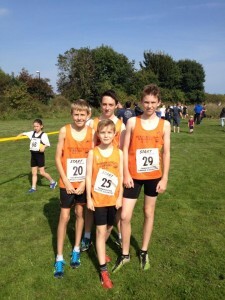 In the U13 boys Chris Milburn, Izaak Taylor and James Garraghan finished 10th with Chris leading the team home. In the U13 Girls Lucy Walker and Rina Sebastiao-Yatsu were our only runners. Lucy finished in 29th and Rina 37th. The u15 boys had a good effort to finish 4th with Michael Wade a strong 12th place. Cameron Allen was 23rd,Will Morgan Rippon 29th, Luke Pickering 31st, Jacob Stephenson 43rd and Mohamed Dugay 58th. In the u15 girls Bridget Bradshaw (31st) and Imogen Coxon (41st) were our only representatives. In the u17/20 Women we had only one representative in Lydia Sharpe who had a fantastic run to win the race. The U17 men had both Joseph Grehan-Bradley and Stefan Renstrom. Joe had a good run to place 9th and Stefan was 33rd. In the U20 Men Oliver Watson had a strong run for 7th place with Michael Cameron 13th. 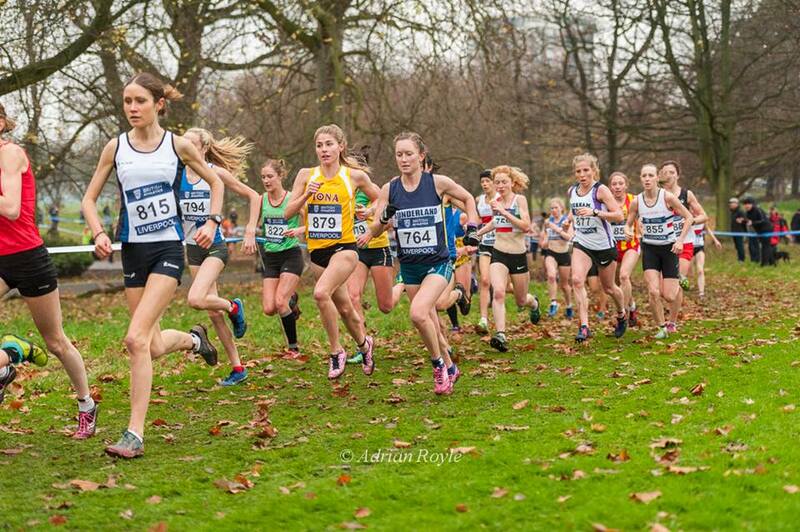 In the senior women Rosie Smith led the team home to secure another NE counties title for herself. She was supported by counters in Aiveen Fox (12th) and Emma Bain (14th). The team took 2nd place.Kim had a strong run to 25th followed by Rachel 46th, Kat 53rd, Alison 60th, Fiona 159th. Well done ladies! Many thanks to everyone who ran and supported another good day for Durham City. A good bus load of Harriers headed up to Northumberland for the 3rd harrier league of the season at the picturesque venue of Wallington Hall. The 2nd year of the event hosted by Morpeth Harriers saw another tough cross country following the Akley Heads mudbath a week earlier. The Course at Wallington is another true cross country with plenty of rough , muddy terrain with testing descents and climbs. We again struggled to field or complete a number of junior teams but there were some great individual performances. The U13 girls finished 6th and the u17/20 women finished a good 3rd. The senior men struggled on the day with a good number of key runners missing or at the Liverpool selection races which left us with 8th place on the day. The senior women maintained their good performance to finish 4th consolidating more their 3rd place overall. Rachel Bentley led the team home with a medium pack promotion followed by Emma Bain, Kim Simpson and Kirstin Farqhuar. The course at Liverpool is predominantly flat with a few little rises through wooded sections, and this year’s course was even more favourable due to the firm underfoot conditions. Furthermore, a spectator friendly course design made for a great atmosphere for both watching earlier races and then participating myself in the last race of the day. 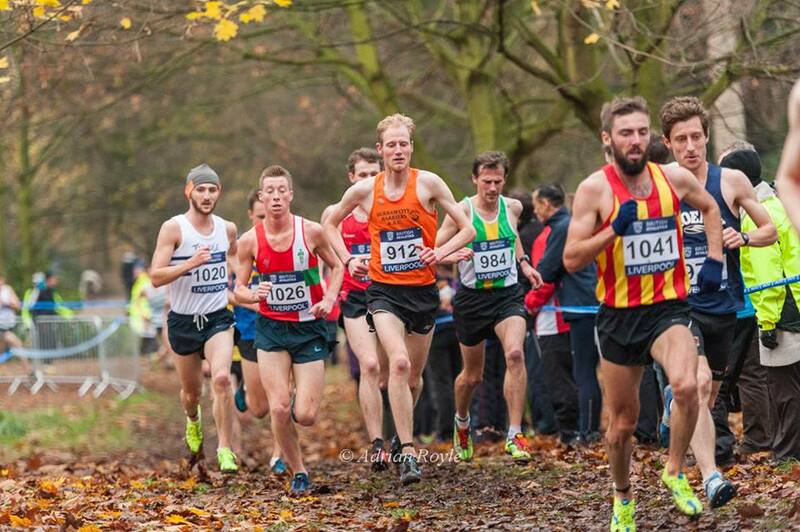 With the race doubling up as a trial race for the forthcoming European XC Championships in Bulgaria, it was of little surprise to see the cream of British cross country talent dotted around the park. There are very few races in the season that enable you to test yourself against the very best, and Liverpool was an opportunity I certainly relished. Rosie Smith was the sole Durham Harriers representative in the senior women’s (including the Under23 race) race of 8.1km and battled hard to a great 14th place (11th senior) in 28:16. Finishing so high up against the very best in the country and only 12seconds behind Commonwealth Games medallist Laura Weightman is a fantastic achievement. Saturday proved she is able to back up a tremendous PB at Leeds Abbey Dash 10k (33:28; 9th woman) with a good performance on the country. This surely bodes well for her North East Championships title defence at Temple Park in just less than two weeks. The final race of the days programme saw the senior and Under23 men battle it out over a 3-lap 9.8km distance. As expected, the pace was relentless from the off (a friend of mine clocking 4:46 for his first mile and still being outside the top 50) and the finishing times would suggest this pace did not ease much. There were three Durham Harriers present in this race and Dan Jenkin led them home with a storming performance to finish 50th (36th senior) in 31:05. Dan continued his great start to the winter season, having recently run a PB at Leeds Abbey Dash (30:37) and also dominating the recent Aykley Heads Harrier League fixture. Hopefully Dan can seriously be considering a top-10 at the upcoming North Eastern Championships, which will no doubt aid the Senior Men’s team on their quest to build on last year’s 3rd place team finish. Following Dan, just 19 seconds back, was Dan Garbutt in 65th place (45th senior) in 31:24 who also ran a PB, and first sub-30 of his career, at the recent Leeds Abbey Dash. I know Dan excels in the tough muddy conditions, exemplified by his North East and Northern XC titles last winter, so maybe the firm underfoot conditions did not play to his strengths. Nonetheless, a very solid performance, and like Rosie will be aiming to defend his North Eastern title in a couple of weeks. Let’s hope for a mud-bath for you mate. 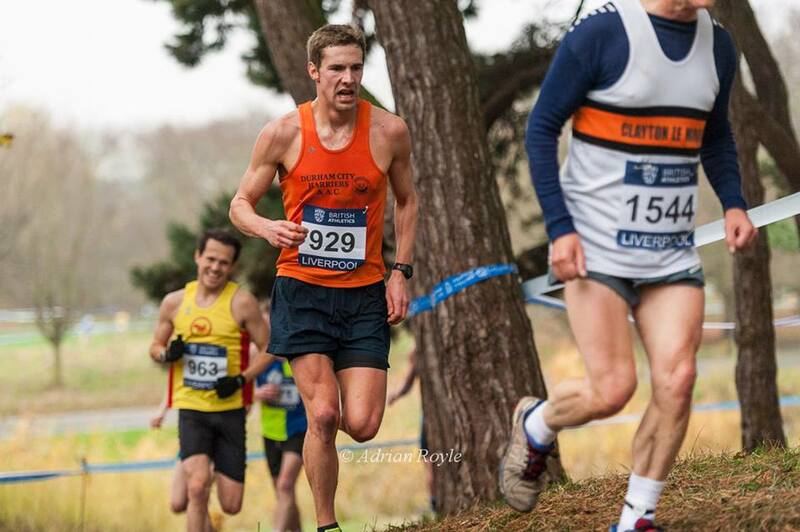 The final runner in orange was Chris Walker, finishing in 200th (73rd U23) in 36:12. I’ve got to say that I was very happy with my performance, which consolidated a good run at last week’s Aykley Heads fixture and further banished my poor performance at Leeds Abbey Dash from my thoughts. The day was a great experience to compare myself to the best runners in the country and learn more about coping with competing in such a high-quality field. Hopefully I can build on this and be in the ‘ballpark’ to be a counter in the senior men’s team at the North East Championships. All credit for the new league race must go to Mark Davison of Derwentside for coming up with the idea. As well as Mark and his Colleagues at Derwentside we must Thank ‘Mudman’ Geoff Davis and his team at Elvet for their hard work too in getting the Akley Heads mudbath off the ground. It was a great result for all 3 clubs involved in the event. ‘Brutal’, ‘cruel’, ‘vicious’, ‘wicked’, and ‘never-again,’ were some comments alleged to have been said, but I think everyone who ran must have enjoyed it! the league lead (albeit short-lived). 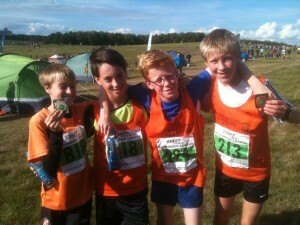 The u13 boys finished well on a tough course in 4th with the u15’s an excellent 2nd. The U13 girls were 8th and the u15 5th over the tough and challenging course. It was a great day of racing and an excellent event; surely to be repeated next year? Durham City men finished in their highest ever position at the National relays on 1st november in Mansfield. 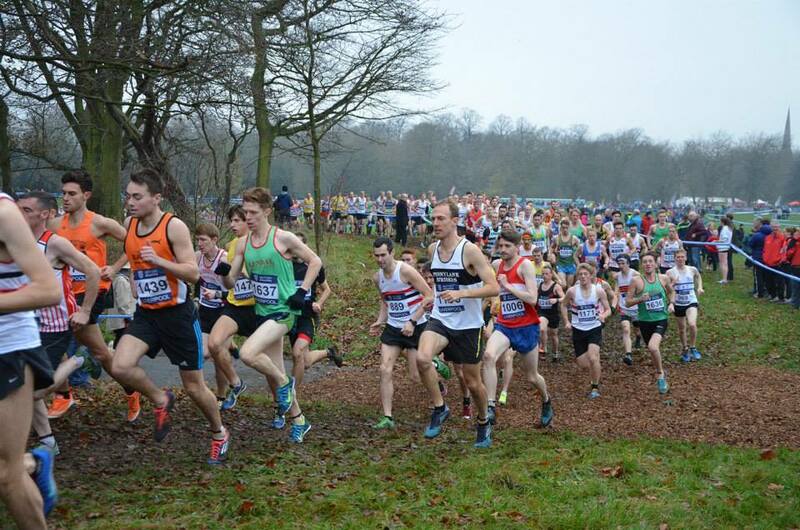 A strong squad of runners took on the 2 lap 5km course at Berry Hill Park, home of Mansfield Harriers whcih has seem many a relay championship. and Senior/vet men taking 2nd place over all in the Sherman cup. The U13 boys had an excellent race to Win with the U15 boys 3rd. We had no full U17 boys teamwhere we struggle for numbers.Our Senior mens 3 counters took 2nd place on the day and with the vet men 9th we secured 2nd place overall behind Morpeth. a dissapointment after last years overall bronze medal. The senior women and vets both finished 5th in their categories flying the flag for the ladies. The overall result was 13th. Many thanks to all who came and ran and supported. Unseasonal weather saw the first fixture of the 1415 season start in bright, hot conditions at Cramlington. No luck for those looking for a muddy course for the start of the season! Dehydration was more of a concern and what to wear on the feet in the dry conditions. There was a good turnout of Tangerines across the age groups, though we were short for a few teams. 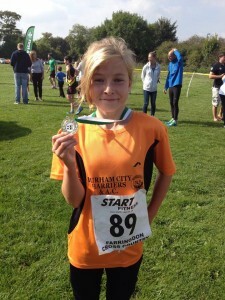 In the U11’s Emily Salmon was the only entrant and ran another great race finishing 17th. The U13 girls finished 6th team with Lucy Walker leading them home in 19th. The U13 Boys had a fantastic win led home by new member Izaak Taylor winning in his first league match. Chris Milburn was 3rd with Sam Gibson 3rd counter in 6th. In the senior races there was a great turnout from the women with 13 taking to the field. Rosie Smith led the team home to win in 26.02 from the medium pack. Kirstin Farquhar had a great run for second counter with Catherine Garbutt 3rd and Kim Simpson 4th from the fast pack. The team finished 6th on the day. There were great performances from many others too trying cross country for the first time!The U15 boys were 4th team on the day led home by Jacob Stephenson in 13th. We had no full team in the U17 boys but Cameron Bain and Joe Grehan-Bradley to fly the club colours.Rebecca Mott led the U17/2O women home in 11th place and the team finished a good 3rd place. The senior men’s race saw 20 men take part. Alex Mirley made a welcome return to the City Harriers and came home 4th leading the senior men to 2nd place on the day. Dan Jenkin was 2nd home from the fast pack with Matt Hornsby, Andy Graham, Rob Hand and Dave King making up the counters. A great day at Cramlington, well done to all that ran! 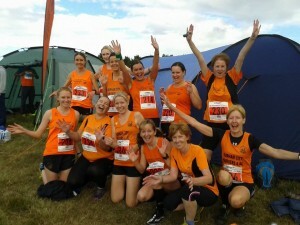 There was a good turnout of Harriers at the Farringdon open races on Saturday 13th September. The event is seen as the the opener to the cross country season which gets underway properly at Cramlington next month. The first event was the U11 race and success for the club straight away with Emily Salmon finishing 3rd in the girls race covering the 1000m course in 4.15. In the u13 race Lucy Walker finished a good 14th in 12:51 despite having been misinformed of of the distance! Elyssen Findlay finished 33rd in her first race I believe for the club! In the boys Izaak Taylor also ran his first cross country finishing in an excellent 4th place. Well done to the U13′s! In the u15 events we on ly had a boys team with some season campaigners in the field. Cameron Allen finished in 8th with Jacob Stevenson in 11th, William Morgan-Rippon 12th and Luke Pickering 17th. At a glance if there were a team result the boys would probably have finished 2nd to Morpeth. The performances and close packing of runners looks good for the Harrier league this season. The U17 category had a lone Durham runner in Alice Campbell who ran a good race finishing 7th in 12.29.